Stanley Felderman and Nancy Keatinge’s work has been featured in the Museum of the Modern Art and the Whitney Museum. Stanley Felderman invented and designed one of the first ATMs and was the first to employ fiber optics, raised flooring and holographic images for the Faberge Headquarters. Pioneers of the “total design concept,” Felderman Keatinge has designed everything from interiors, architecture, and graphics to industrial design, utilizing Stanley Felderman’s hand sketches to envision the diversity of award winning projects. Felderman Keatinge have always been future-forward: constantly in search of fresh perspectives and new frontiers, each new project stands as further proof of its commitment to one-of-a-kind solutions tailored to each and every client. Felderman Keatinge take a humanistic approach and views interiors as a living organism, which is an extension of ourselves effecting how we live and work. 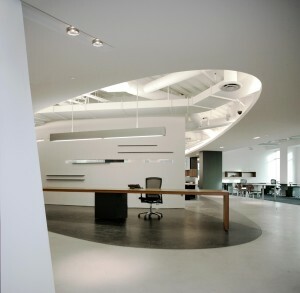 The firm’s goal is to elevate the quality of ones experience of the built environment. Felderman Keatinge continue to question the norm and look to constantly reinvent the way we live and work. Nancy Keatinge and Stanley Felderman worked with Ray Anderson as part of the original Interface Inc. team developing the early initiative for environmentally responsible design – the foundation for today’s LEED Certification. Felderman Keatinge have designed for manufacturers including Venini, Herman Miller, Steelcase, Haworth, Inscape Solutions and Cappellini. Their clients include Legendary Pictures, Creative Artists Agency, Core Media Group / 19 Entertainment, Shine America, Paradigm Talent Agency, MTV Networks, Walt Disney Company, Mattel, Universal Music Group, Samsung Corporation, Sony, Mattel, Sheppard Mullin Richter & Hampton, and Pillsbury Winthrop. Nancy Keatinge and Stanley Felderman have been asked to teach and lecture for organizations such as the Salone Internazionale Della Sedia in Udine, Italy, Neocon in Chicago, several AIA chapters, the Newport Harbor Art Museum, the University of California at Los Angeles and Irvine, as well as the Pratt Institute in Brooklyn, and Woodbury University. Their work has been featured in numerous books and publications including the New York Times, Newsweek, Fortune, Forbes, The Wall Street Journal, People, Progressive Architecture, Interior Design Magazine and many others.